After another great talk at @wp_glasgow from @kayleighthorpe of @34SP , the @refvoicesscot site had another tweak. Thinking of doing your own website? The Glasgow WordPress Meetup https://t.co/0GokEGmFmp is the place to get support. 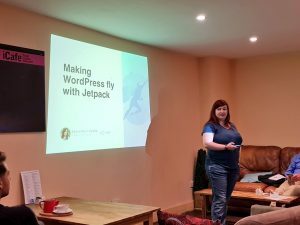 Making WordPress Fly with Jetpack (updated), by Kayleigh Thorpe – Tues. 22nd May, 6:00pm at iCafe Sauchiehall St. In this talk Kayleigh will be showing the various features of the Jetpack plugin, from its built in analytics, to form and portfolio building, and how you can use the Jetpack plugin to improve your site’s visibility.